This is what is useful to the “young prince”; the gradual normalization of ties, which he actually intentionally expressed through meetings, statements and media platforms launched to promote his position. His various methods work and strive to create and convince public opinion of the usefulness of appeasing the enemy to the point of allying with it. The goal is to confront Iran and portray it as the greatest threat to the kingdom. Bin Salman relays on a group of writers and broadcasters to spread the concepts of “peace” and harmony with the Jews. Some of those are former Al-Arabiya channel director Abdel Rahman Al-Rashed, as well as writers Ahmad Al-Arfaj, Ahmed Al-Faraj, Turki Al-Hamad, Mohammed Al-Sheikh, Hamza Al-Salem, Saud Al-Fawzan, Suad Al-Shammari and last but not least Daham Al-Enezi who called for the establishment of a Zionist embassy in Riyadh. In addition there are those who are fluent in Hebrew. They compete on social networking sites to attract Zionist activists from within the occupied territories and interact with them under the title of “electronic peace”, at least until now. They have the absolute freedom to court figures within the usurping entity and its axis as long as they agree on attacking the Islamic Republic and inciting against it. Because tweeting in Hebrew is not a crime in Saudi Arabia, the Saudi writer and programmer, Louay Al-Sharif, addresses the Zionists all the time through his Twitter account. He chooses to tweet in Hebrew to comment on local or even regional news. A few months ago, he recorded a video clip in which he said that “Saudi Arabia has never threatened any of ‘its neighbors’.” He also called on ” the ‘people of “Israel”’ to read the news accurately.” This message was well received by Tel Aviv, so much so that it took care of broadcasting it. Al-Sharif, who is known for his strong relationship with the royal court and for his role in the Saudi Crown Prince’s “MiSK” Foundation, allocates his [Twitter] account to acquaint his more than 150,000 followers to the “people” of “Israel” and their history. He claims to interact with Zionist tweeters based on his interest in “Jewish heritage”. Similarly, Abdul Rahman al-Qahtani, who presents himself as a person interested in Hebrew and is fond of Bin Salman, is also active. Al-Qahtani’s posts highlight his focus on attacking Iran and resistance movements in Palestine and the region. He even retweets Zionist and American activists who attack Hamas and glorifies the crown prince. He is keen to use the flag of “Israel” in most of his Tweets that are related to the usurper entity and Saudi Arabia. Meanwhile, Mohammad al-Ghalban pioneers the Saudi figures that master the enemy’s language. He has a PHD in Hebrew. He is a professor of Hebrew and Jewish studies at the Department of Modern Languages ? ?and Translation at the College of Languages ? ?and Translation at King Saud University in Riyadh. He has an MA and a PHD in Philosophy from the Faculty of Arts, the Department of Near Eastern Languages ? ?and its Cultures in the Indiana-Bloomington University, USA. His general specialization is Hebrew, and his secondary one is in Jewish studies. He has more than 20 years of experience in Modern Hebrew and translation. 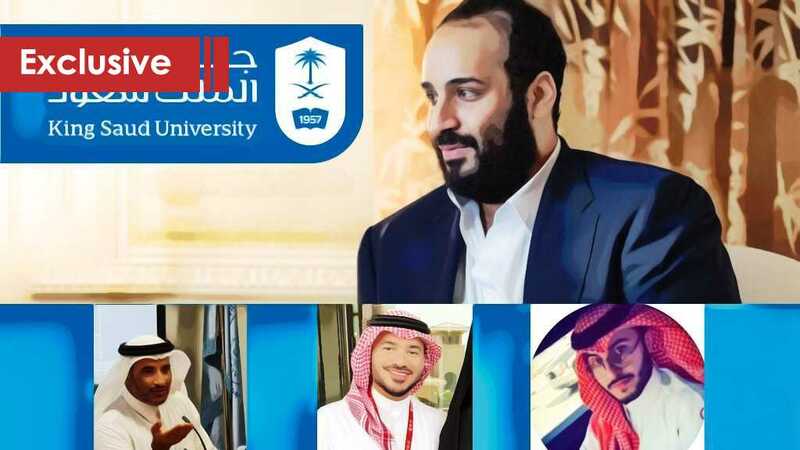 Not only that, but King Saud University presents him as someone who has extensive knowledge of what appears in Zionist media, is well-informed in “Israeli” and Jewish studies and abreast with the provisions of Jewish religious laws and cultures. He is even fluent in “Yiddish” which is the language of Ashkenazi Jews. Al-Ghabban believes that the negative attitudes in Saudi Arabia towards the study of Hebrew will change, noting that “a decade ago it was seen as an enemy’s language, but now it is the language of the other,” as he puts it. The Hebrew Language Program is one of the programs of the Department of Modern Languages and Translation at the College of Languages and Translation at King Saud University. It was activated when the Language and Translation Institute was transformed into a College of Languages and Translation at King Saud University under the 1994 Royal Decree. It is the only program in the Gulf region in general and in the Kingdom in particular that grants a bachelor’s degree in translation from and to Hebrew. Saudi Arabia is not likely to stop these activities but rather expand them and perhaps open more institutes that teach Hebrew. In this context, Louay Al-Sherif spoke about the allocation of an educational platform for the teaching of languages, including Hebrew that will be launched soon in the Kingdom. Will Bin Salman be the first to join or will there be no need for it in light of the full understanding and harmony with the Zionists? It can be said today that Saudi Arabia is unable to surprise Arab public opinion in general and the Saudi one in particular, as it placed it at the heart of its normalization policy. It is only concerned about its hostility towards Iran, and nothing else. Originally, it derives from the former Mufti Abdul Aziz bin Baz’s fatwa regarding reconciliation with the Jews. Justifications for the ratification of the upcoming agreement of humiliation with Tel Aviv derive from this fatwa. But the question is why was the announcement delayed, especially since the popular base is ready for it? What is the Royal Court waiting for following the secret meetings between Bin Salman and Zionist officials in the occupied territories and before that in the United States in March and April, according to leaks by “Israeli” and American media?